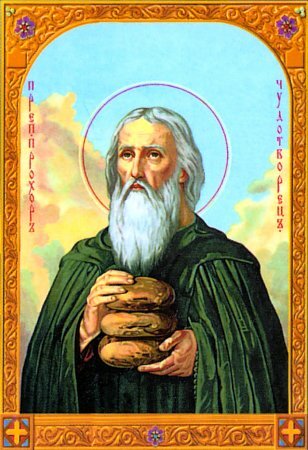 (Church calendar - Jul 22) Synaxis of saints of Smolensk (movable feast on the Sunday before July 28th). During the saint’s lifetime, a famine threatened Russia. Prochorus began to gather the pigweed even more zealously and to prepare his “bread”. Certain people followed his example, but they were not able to eat this weed because of its bitterness. Prochorus distributed his pigweed bread to the needy, and it tasted like it was made from fine wheat. Only the bread given with the blessing of Saint Prochorus was edible, and even pure and light in appearance. If anyone tried to prepare this bread himself, or take it without the saint’s blessing, it was not fit for consumption. This became known to the igumen and the brethren, and the fame of Prochorus spread far and wide. After a certain while there was no salt at Kiev, and the people suffered because of this. Then the saint gathered ashes from all the cells, and began to distribute it to the needy. Through his prayers, the ashes became pure salt. The merchants, who hoped to take advantage of this shortage of salt for their own profit, became angry with Saint Prochorus for distributing free salt to the people. Prince Svyatopolk confiscated the salt from Prochorus. When they transported it to the prince’s court, everyone saw that it was just ordinary ashes. After three days, Svyatopolk gave orders to discard it. Saint Prochorus blessed the people to take the discarded ashes, and they were again changed into salt. This miracle reformed the fierce prince. He began to pray zealously, made peace with the igumen of the monastery of the Caves, and highly esteemed Saint Prochorus. When the last hour of the saint approached, the prince left his army and hastened to him, even though he was at war. He received his blessing and with his own hands, carried the body of the saint to the cave and buried him. Returning to his army, Svyatopolk easily gained victory over the Polvetsians, turning them to flight and capturing their supply carts. Such was the great power of the prayer of Saint Prochorus. The righteous one died in the year 1107, and was buried in the Near Caves. He is also commemorated on September 28 and on the second Sunday of Great Lent.